Shortstop Kacey Maines of Carthage, Texas, had two hits and drove home a run Saturday in helping Texas A&M University-Texarkana beat Sterling College, 8-0. Second-year coach Marie Stone was obviously unhappy after Texas A&M University-Texarkana’s softball team dropped its first two games of the season Friday in the Eagles Classic at Bramlett Field in Spring Lake Park. 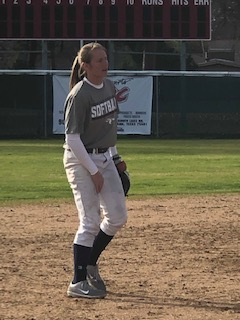 Sterling College and Webber International roughed up senior pitchers Cassie Vasquez and Ashley Nipper in Friday’s two setbacks. Nipper and Vasquez bounced back with gems Saturday, leading the Eagles past Sterling, 8-0, and Webber International, 2-1. Nipper had all kinds of offensive support, while holding Sterling College (Sterling, Kan.) to three hits in the five-inning opener. She did not walk a batter, while striking out four. The Eagles scored of the runs they would need with two in the first inning. A four-run uprising in the fourth led to a short contest via the eight-run rule. Junior Lauren Bierschenk led Texarkana’s eight-hit attack with two doubles and two RBI. Shortstop Kacey Maines was also 2-for-2 with a run-scoring single. Catcher Hannah Cooper drove home two runs and scored twice, while Kayla Mahan scored three runs, and contributed a single. Saturday’s second game was even more impressive considering Webber International (Bapson Park, Fla.) had beaten Sterling in Friday’s openers, 11-1, and the Eagles, 12-1. Webber finished 3-1 in the classic, while Sterling was 1-3. Vasquez fell behind 1-0 early, the Eagles scoring their two runs in the third. Cooper had a run-scoring single, and Morgan Bullock added a sacrifice fly. Vasquez scattered five hits, walking three and striking out three. A&M-Texarkana (2-2) will be back in action Feb. 8 in the Cowtown Classic in Fort Worth. The Eagles play Bethel College in their opener.